Marcia & I met in homeroom in 7th Grade. I went to several parties at her house in Glynlea. It was always fun because she invited a lot of people...and they usually all showed up. We had a great time! May she rest in peace now and forever. Marcy was a beautiful redhead with a wonderful laugh. I enjoyed having her as a friend. We went to a lot of dances together- (remember the Southside Woman's Club? )I often remember that she would forego a Saturday dance in order to see an Elvis Presley movie on television. Elvis wasn't my kind of guy at that time, but, in retrospect, I can see his appeal. I always thought Marcy was special. I am so saddened that she left us so young. Such sad news about Marcie Such a sweet person. 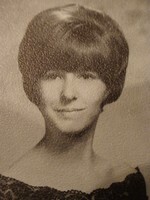 Marcia "Marcie" passed away January 12, 1999. Her obituary was posted in the Times Union on Friday, January 15, 1999 - PARKER - Marcia Jerelyn Parker (Farabee), 47, formerly of Jacksonville, Florida died Tuesday, January 12 (1999). The service will be held in Lexington, NC, contact Davidson Funeral Home for service time and date.. Surving: Loving family - Sons:; Corey Michael Gaston and Brian Nichols Hall; mother Mary C. Parker, father Ernest J. Parker, Sr, brother Ernest J Parker, Jr, sister, Cynthia L Parker.